Item. Of late, there have been sightings and reports of sightings of ghosts of the super typhoon’s victims in Tacloban City. In large numbers, they hail public transport at night and would just disappear as mists upon the vehicles’ approach. They appear drenched, disoriented and disheveled. Item. On May 16, 2012, eve of the Guinarona Centennial Fiesta, thousands of orbs floated where the Centennial Fireworks was being held. 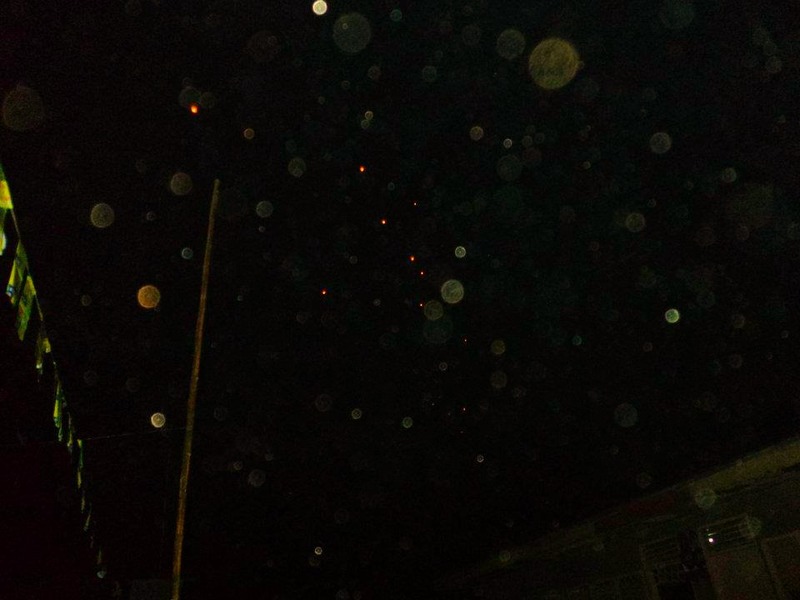 Orbs are essentially of the spirit realm, indicating that they were also one in celebrating San Pascual’s Centennial. Question: Where does the physical earth end and the spirit word begin? It is commonly said that earth is essentially a school where humans learn their lessons, before they graduate to the spirit realms, where they form concentric circles around earth. It would seem that the first circle, which abuts the earth’s surface–thus an interface–is the lowest realm and the domain of bad karma, bad harvest if you will. And the definitive source of this knowledge is Monsignor Robert Hugh Benson, whose seminal work on the spirit world he was able to write posthumously through a medium. Below are the salient points about the Monsignor’s opus. 1. That science and technology on earth originate from the spirit realm. And our own Spirit scientists can – and do – impress their Earthly colleagues with the fruits of their investigation. In many cases where two men are working upon the same problem, the one who is in Spirit will be far ahead of his confrere who is still on Earth. A hint from the former is very often enough to set the latter upon the right track, and the result is a discovery for the benefit of Humanity. In so many cases Humanity has so benefited, but, alas, in so many cases Humanity has suffered sorrow and tribulation through the devilish perversion of those discoveries. Every one of them that is sent from the Spirit world is for the advantage and Spiritual progression of man. If perverted minds use those same things for the destruction of man, then man has only himself to blame. That is why I affirmed that the Earth world has not Spiritually progressed enough to have many more splendid inventions that have already been perfected here. They are ready and waiting, but if they were sent through to the Earth-plane in its present state of Spiritual mind, they would be misused by unscrupulous people. The generality of people of the Earth world are very stubborn. They resent any encroachment on their preserves, or upon what they have presumptuously claimed as their preserves. It was never intended that when the results of our scientists’ researches are communicated to the Earth they were to be seized upon by the few to the exclusion of all others. Those that have done so find that they have to pay a very heavy price for their brief span of Earthly prosperity. Neither was it intended that the two worlds, ours and yours, should be as they are now, so far apart in thought and contact. The day will assuredly come when our two worlds will be closely interrelated, when communication between the two will be a commonplace of life, and then the great wealth of resources of the Spirit world will be open to the Earth world, to draw upon for the benefit of the whole Human race. 2. About the fallacious teachings and dogmas of the Church. When Edwin, Ruth, and I were on Earth we were asked to believe that God, the Father of the Universe, punishes, actually punishes people by condemning them to burn in the flames of hell for all eternity. Could there ever be any grosser travesty of the God that orthodoxy professes to worship? The churches – of whatever denomination – have built up a monstrous conception of the Eternal Father of Heaven. They have made of Him, on the one hand, a mountain of corruption by shallow lip service, by spending large sums of money to erect churches and chapels to His ‘glory’, by pretending a groveling contrition for having ‘offended Him’, by professing to fear Him – fear Him Who is all love! And on the other hand, we have the picture of a God Who, without the slightest compunction, casts poor Human souls into an eternity of the worst of all sufferings – burning by fires that are unquenchable. The thought inevitably came into my mind of the doctrine of eternal damnation, so beloved by orthodox religion, and of the everlasting fires of so-called hell. If this place we were now could be called hell – and no doubt it would be by theologians – then there was certainly no evidence of fire or heat of any kind. On the contrary, there was nothing but a cold, dank atmosphere. Spirituality means warmth in the Spirit world; lack of Spirituality means coldness. The whole fantastic doctrine of hell-fire – a fire which burns but never consumes – is one of the most outrageously stupid and ignorant doctrines that has ever been invented equally stupid and ignorant churchmen. Who actually invented it no one knows, but it is still rigorously upheld as a doctrine by the church. Even the smallest acquaintance with Spirit life instantly reveals the utter impossibility of it, because it is against the very laws of Spirit existence. This concerns its literal side. What of the shocking blasphemy that it involves? We are taught glibly to beg for God’s mercy. The Church’s God is a Being of extraordinary moods. He must be continually placated. It is by no means certain that, having begged for mercy, we shall get it. He must be feared – because He can bring down His vengeance upon us at any moment; we do not know when He will strike. He is vengeful and unforgiving. He has commanded such trivialities as are embodied in church doctrines and dogmas that at once expose not a great mind, but a small one. He has made the doorway to ‘salvation’ so narrow that few, very few souls will ever be able to pass through it. He has built up on the Earth-plane a vast organization known as ‘the Church’, which shall be the sole depository of Spiritual truth – an organization that knows practically nothing of the state of life in the world of Spirit, yet dares to lay down the law to incarnate souls, and dares to say what is in the mind of the Great Father of the Universe, and dares to discredit His Name by assigning to Him attributes that He could not possibly possess. What do such silly, petty minds know of the Great and Almighty Father of Love? Mark that! – of Love. Then think again of all the horrors I have enumerated. And think once more. Contemplate this: a heaven of all that is beautiful, a heaven of more beauty than the mind of man incarnate can comprehend; a heaven, of which one tiny fragment I have tried to describe to you, where all is peace and goodwill and love among fellow mortals. All these things are built up by the inhabitants of these realms, and are upheld by the Father of Heaven in His love for all mankind. If any priest – or theologian – could have but one glimpse of the things that Edwin, Ruth, and I saw here, he would never say again, as long as he lived, that God, the Father of Love, could ever condemn any mortal to such horrors. The same priest, seeing these places, would not himself condemn anyone to them. Is he more kind and merciful than the Father of Love Himself? No! It is man alone who qualifies himself for the state of his existence after he passes into Spirit. The more we saw of the dark lands the more I realized how fantastic is the teaching of the orthodox church to which I belonged when on Earth, that the place which is referred to as eternal hell is ruled over by a Prince of Darkness, whose sole aim is to get every soul into his clutches, and from whom there is no escape once a soul has entered his Kingdom. Is there such an entity as the Prince of Darkness? There might conceivably be one soul infinitely worse than all the others, perhaps it will be said, and such as he could be considered as the very King of Evil. Edwin told us that there was no evidence whatever of such a personage. There were those from the upper spheres who had traversed every inch of the lower realms, and they had discovered no such being. There were also those whose knowledge was prodigious, and who positively affirmed that the existence of such a person had no foundation in fact. Doubtless there are many who, collectively, are a great deal more evil than their fellows in darkness. The idea that a King of Evil exists, whose direct function is to oppose the King of Heaven, is stupid; it is primitive and even barbaric. The Devil as a solitary individual does not exist, but an evil soul might be called a devil, and in that case there are many, many devils. It is this fraternity, according to the teachings of one orthodox church, that constitutes the sole element of Spirit return. We can afford to laugh at the absurdities of such teachings. It is no novelty for some wondrous and illustrious Spirit to be called a devil! We still retain our sense of humor, and it causes us very great amusement, sometimes, to hear some stupid priest, Spiritually blind, professing to know about things of the Spirit of which, in reality, he is totally and completely ignorant. The Spirit people have broad backs, and they can support the weight of such fallacious rubbish without experiencing anything but pity for such poor souls. 3. About one’s position in the spirit world as harvest. The beauty of the Spirit world is the outward and visible expression of the Spiritual progression of its inhabitants. When we have earned the right to possess things of beauty, they are given to us through the power of creation. In this sense we can be said to have created them ourselves. Beauty of mind and deed can produce nothing but beauty, and hence we have flowers of heavenly beauty, trees and meadows, rivers and streams and seas of pure, glistening, crystal-clear water, magnificent buildings for the joy and benefit of us all, and our own individual homes where we can surround ourselves with still more beauty, and enjoy the delights of happy converse with our fellows. But ugliness of mind and deed can produce nothing but ugliness. The seeds of hideousness sown upon the Earth-plane will inevitably lead to the reaping of a harvest of hideousness in the Spirit world. These dark realms have been built up by the people of the Earth-plane, even as they have built up the realms of beauty. No single soul is forced into either the realms of light or those of darkness. No soul could possibly take exception to anything he found in his realm of light, since discontent or disapproval, discomfort or unhappiness cannot exist in these realms. We are a supremely happy, united body of people, and we live together in complete harmony. No soul could, therefore, feel ‘out of place’. The denizens of the realms of darkness have, by their lives on Earth, condemned themselves, each and every one, to the state in which they now find themselves. It is the inevitable law of cause and effect; as sure as night follows day upon the Earth-plane. Of what avail to cry for mercy? The Spirit world is a world of strict justice, a justice that cannot be tampered with, a justice which we all mete out to ourselves. Strict justice and mercy cannot go together. However wholeheartedly and sincerely we may forgive the wrong that has been done to us, mercy is not given to us to dispense in the Spirit world. Every bad action must be accounted for by the one who commits it. It is a personal matter which must be done alone, even as the actual event of death of the physical body must be gone through alone. No one can do it for us, but by the great dispensation upon which this and all worlds are founded, we can, and do, have ready and able assistance in our tribulation. Every soul who dwells in these dreadful dark realms has the power within himself to rise up out of the foulness into the light. He must make the individual effort himself, he must work out his own redemption. None can do it for him. Every inch of the way he must toil himself. There is no mercy awaiting him, but stern justice. But the golden opportunity of Spiritual reclamation is ready and waiting. He has but to show an earnest desire to move himself one fraction of an inch towards the realms of light that are above him, and he will find a host of unknown friends who will help him towards that heritage which is his due, but which in his folly he cast aside. 4. How does one appear in the spirit world? Now to come to the Spirit body itself. The Spirit body is, broadly speaking, the counterpart of our Earthly bodies. When we come into the Spirit world we are recognizably ourselves. But we leave behind us all our physical disabilities. We have our full complement of limbs, our sight and our hearing; in fact, all our senses are fully functioning. Indeed, the five senses, as we know them upon Earth, become many degrees more acute when we are discarnate. Any supernormal or subnormal conditions of the physical body, such as excessive stoutness or leanness, vanish when we arrive in these realms, and we appear as we should have appeared on Earth had not a variety of Earthly reasons caused us to be otherwise. There is a stage in our lives on Earth which we know as the prime of life. It is towards this that we all move. Those of us who are old or elderly when we pass into Spirit will return to our prime-of-life period. Others who are young will advance towards that period. And we all preserve our natural characteristics; they never leave us. But we find that many minor physical features that we can profitably dispense with, we shake off with our Earthly bodies – certain irregularities of the body with which, perhaps, we have been born, or that have come upon us during the course of the years. How many of us are there, I wonder, when we are incarnate, who could not think of some small improvement that we should like to make in our physical bodies, were it at all possible! Not many! I have told you how the trees in these realms grow in a state of perfection – upright and clean-looking and well-formed, because they have no storms of wind to bend and twist the young branches into malformations. The Spirit body is subject to just the same law here in Spirit. The storms of life can twist the physical body, and if that life has been Spiritually ugly the Spirit body will be similarly twisted. But if the Earth life has been Spiritually sound, the Spirit body will be correspondingly sound. There is many a fine soul inhabiting a crooked Earthly body. There is many a bad soul inhabiting a well-formed Earthly body. The Spirit world reveals the truth for all to see. How does the Spirit appear anatomically, you will ask? Anatomically, just exactly the same as does yours. We have muscles, we have bones, we have sinews, but they are not of the Earth; they are purely of Spirit. We suffer from no ailments – that would be impossible in the Spirit world. Therefore our bodies do not require constant looking after to maintain a state of good health. Here our health is always perfect, because we have such a vibrational rate that disease, and the germs that cause it, cannot enter. Malnutrition, in the sense that you know it, cannot exist here, but Spiritual malnutrition – that is, of the Soul – does most certainly exist. A visit to the dark realms and their neighborhood will soon reveal that! Does it seem strange that a Spirit body should possess finger nails and hair? How would you have us to be? Not different from yourselves in this respect, surely? Would we not be something of a revolting spectacle without our usual anatomical features and characteristics? This seems an elementary statement, but it is sometimes necessary and expedient to voice the elementary. How is the Spirit body covered? A great many people – I think it would be true to say the great majority – wake up in these realms dressed in the counterpart of the clothes they wore when upon the Earth-plane at the time of their transition. It is reasonable that they should, because such attire is customary, especially when the person has no foreknowledge whatever of Spirit world conditions. And they may remain so attired for just as long as they please. Their friends will have told them of their true state of being, and then they can change to their Spirit clothing if they so wish. Most people are only too glad to make the change, since their old Earthly style of clothing looks very drab in these colorful realms. It was not long before I discarded my old clerical attire for my true raiment. Black is altogether too somber amongst such a galaxy of colour! Spirit robes vary in themselves almost as much as the realms vary. There always seems to be some subtle difference between one person’s Spirit robe and another’s, both in colour and form, so that there is an endless variety in the two particulars of colour and form alone. All Spirit robes are of full length; that is, they reach down to the feet. They are sufficiently full to hang in graceful folds, and it is these very folds that present the most beautiful shades and tones of color by the effect of what on Earth would be called ‘light and shade’. It would be impossible to give you anything like a comprehensive account of the different additional features that go to make up the whole composition of Spirit vesture. Many people will be found wearing a girdle or sash around the waist. Sometimes these will be of material, sometimes they appear to be of gold or silver lace or tissue. In all cases of the latter, they are rewards for services performed. No possible conception can be formed of the superlative brilliance of the golden or silver girdles that are worn by the great personages from the higher realms. They are usually adorned with the most beautiful of precious stones, fashioned in various shapes, and mounted in beautifully wrought settings, according to the rulings that govern such matters. The higher beings, too, will be seen to be wearing the most magnificent diadems as brilliant as their girdles. The same law applies to these. Those of us of lesser degree may perhaps be wearing some such embellishment as I have just described, but in a greatly modified form. There is an enormous wealth of Spirit lore behind the whole subject of Spirit adornments, but one fact can be plainly stated: all such adornments must be earned. Rewards are given only upon merit. We may wear what we like upon our feet, and most of us prefer to wear a covering of some sort. It usually takes the form of a light shoe or sandal. I have seen numbers of people here who have a predilection for going barefooted, and they do so. It is perfectly in order, and it excites no comment whatever. It is natural and commonplace with us. The material of which our robes are made is not transparent, as some would perhaps be inclined to imagine! It is substantial enough. And the reason why it is not transparent is that our clothing possesses the same vibrational rate as the wearer. The higher one progresses the higher this rate becomes, and consequently dwellers in those elevated spheres will take on an unimaginable tenuousness both of Spirit body and clothing. That tenuousness is the more apparent to us than to them, that is, externally apparent, for the same reason that a small light will seem so much the brighter by virtue of the surrounding darkness. When the light is magnified a thousand times – as it is in the case of the higher realms – the contrast is immeasurably greater. We seldom wear any covering upon our heads. I do not remember seeing anything of the sort anywhere in this realm. We have no need for protection against the elements! I think you will have concluded by now that to be a Spirit person can be a very pleasant experience. And in my travels through these Realms of Light I have yet to find a single solitary individual who would willingly exchange this grand, free life in the Spirit world for the old life upon the Earth-plane. 5. Where do dead children go? One of the innumerable questions that I put to Edwin, shortly after my arrival in the Spirit world, concerned the destiny of children who, as such, passed into Spirit lands. There is a period of our Earthly lives which we are accustomed to call ‘the prime of life’. There is also a prime of life here in Spirit, and it is towards that period that all souls either advance or return, according to the age at which their transition takes place. How long it will take rests entirely with themselves, since it is purely a matter of Spiritual progression and development, though with the young this period is usually much shorter. Those who pass into Spirit after the prime of life period has been reached, whether they be elderly or extremely aged, will, in due time, become younger in appearance, although they will grow older in knowledge and Spirituality. It must not be assumed from this that we all eventually reach a dead level of commonplace uniformity. Outwardly, we look young; we lose those signs of the passage of years which cause some of us no little disturbance of mind when we are incarnate. But our minds become older as we gain knowledge and wisdom and greater Spirituality, and these qualities of the mind are manifest to all with whom we come into contact. When we visited the temple in the city, and, from a distance beheld the radiant visitor whom we had come to honor, he presented to the eye the appearance of perfect – and eternal – youth. Yet the degree of knowledge and wisdom and Spirituality which he diffused, and which we could feel with our minds, was almost overpoweringly great. It is the same, in varying degrees, with all those who visit us from the higher realms. If, therefore, there is this rejuvenation of fully grown people, what of the souls who pass over as children; indeed, what of those, even, who pass into the Spirit world at birth? The answer is that they grow as they would have grown upon the Earth-plane. But the children here – of all ages – are given such treatment and care as would never be possible in the Earth world. The young child, whose mind is not yet fully formed, is uncontaminated by Earthly contacts, and on passing into the Spirit world it finds itself in a realm of great beauty, presided over by souls of equal beauty. This Children’s Realm has been called the ‘Nursery of Heaven’, and surely anyone who has been fortunate enough to have visited it will say that a more apposite term could not be found. It was, therefore, in response to my original question that Edwin proposed that Ruth and I should accompany him on a visit to the nursery of heaven. We walked towards the boundary between the higher realm and our own, and we turned in the direction of Edwin’s house. Already we could feel the atmosphere more rarified, though it was not sufficiently pronounced to cause us any inconvenience or discomfort. I noticed that this atmosphere had a great deal more color in it, much more than in the depths of the realm. It was as though a great number of shafts of light were meeting and spreading their broad beams over all the landscape. These shafts of light were for ever on the move, interweaving themselves and producing the most delicate and delightful blendings of colour, like a succession of rainbows. They were extremely restful, but they were also filled with vitality and, as it seemed to Ruth and me, lightheartedness and merriment. Sadness and unhappiness, one felt, would be utterly impossible here. The countryside took upon itself a much brighter green in its verdure, the trees were not so tall, but they were as shapely as every other tree in these realms, and they were growing as perfectly. After we had proceeded a little distance the atmosphere became clear of the coloured beams, and it more resembled that of our own sphere. But there was a strange and subtle difference which was puzzling to the visitor upon his first visit, and it arose, so Edwin told us, from the essential Spirituality of the children who live there. Something akin to this is to be encountered when one is privileged to journey to a higher realm than that in which one normally resides. It is almost as though there were a greater degree of buoyancy in the air, apart altogether from a noticeable effect of elevation of the mind. We saw many fine buildings before us as we walked along the soft grass. They were not of any great height, but they were broad in extent, and they were all most pleasantly situated among trees and gardens. Flowers, needless to say, were growing prolifically everywhere, in artistically-arranged beds, as well as in large masses upon the grassy slopes and beneath the trees. I noticed that in some instances flowers that have their counterpart upon the Earth-plane, were growing by themselves, those that were proper to the Spirit world being separated from them. We were told that there was no special significance in this segregation, but that it was done solely to show the distinction between the two classes of flowers, the Spirit and the Earthly. Beautiful as the Earthly flowers are that grow here, there can be no comparison with those that belong alone to Spirit lands. Here again one is limited by Earthly experience in any attempt to describe them. Not only are the colorings richer, but the conformations of the flowers and foliage present such an abundance of unparalleled beauty of design that we have no Earthly example to adduce by way of comparison. But it must not be supposed that these magnificent flowers remotely suggested the rare hot-house bloom. Far from it. The superabundance of them, together with the great strength and variety of their perfumes, would instantly dispel any thought of rarity. It was no case of cultivating the beauty of the bloom at the expense of its perfume. They all possessed the quality common to all growing things here, that of pouring out energizing force, not only through the medium of their aromas, but through personal contact. I had already tried the experiment of holding a flower within the cupped hands – it was Ruth who had instructed me – and I had felt the stream of life-force flowing up my arms. We could see delightful ponds and small lakes, upon the surface of which were flourishing the most beautiful water flowers in the gayest colours. In another direction we could see larger expanses of water like a series of lakes, with many small boats gliding serenely along. The buildings were constructed of a substance that had all the appearance of alabaster, and they were all tinged with the most delicate colours, such as one is accustomed to seeing in the subtle blendings of an Earthly rainbow. The style of architecture resembled, for the most part, that of our own sphere; that is to say, some of the buildings bore upon their surface the most exquisite carvings of such natural objects as abound in the trees and flowers, while others drew for their relief upon the normal features particular to the Spirit world. But what gave us the most enjoyable surprise was to see, interspersed throughout the woods, the quaintest little cottages such as one was always inclined to believe only belonged to the pages of children’s story-books. Here were diminutive houses with crooked timbers – beautifully crooked – with bright red roofs and lattice-windows, and each with a charming little garden, all its own, surrounding it. It will at once be concluded that the Spirit world has borrowed from the Earth world in these fanciful creations for the children’s delight, but such is not the case. In truth, this whole conception of miniature houses emanated, in the first instance, from the Spirit world. Whoever was the artist who received our original impression, she has been lost to the Earth world through the course the years. That artist is known to us here, though, where she continues her work in the children’s sphere. These little houses were large enough to allow a grown person plenty of room in which to move without appearing to knock his head! To the children they seemed to be of just the right size without their feeling lost within them. I learnt that it was for this same reason that all the large buildings in this realm were without any appreciable height. By thus not making them too high, nor the rooms too large, they conformed with the child’s mind, as yet not fully formed, where spaces seem greater than they really are, and where buildings too spacious would have the effect upon the little mind of seeming to dwarf it. Great numbers of children live in these tiny dwellings, each being presided over by an older child, who is perfectly capable of attending to any situation that might arise with the other ‘residents’. As we walked along we could see groups of happy children, some playing games with their fellows, others seated upon the grass while a teacher was reading to them. Others, again, were to be observed listening attentively and with marked interest to a teacher who was explaining the flowers to them, and giving them something of a lesson in botany. But it was botany of a very different order from that of the Earth-plane, in so far as the purely Spirit flowers were concerned. The distinctions between the Earthly flowers and the Spirit flowers were amply demonstrated by the two orders of flowers being separated. Edwin took us to one of the teachers, and explained the reason of our visit. We were instantly made welcome and the teacher was kind enough to answer a few questions. Her enthusiasm for her work added to her pleasure, she said, in telling us anything we wished to know. As to herself, she had been in the Spirit world a goodly number of years. She had had children of her own when upon the Earth-plane, and she was still keenly interested in their welfare, and that had led her to take on her present work. So much she told us of herself. It was not very informative, and we knew as much without her having to tell us! What she did not tell us – it was Edwin who later gave us the details – was that she had made such a success with her own children upon Earth, who now joined their mother in her work, that it had been obvious from the commencement just what her work would be in Spirit lands. Needless to say, it was the very work upon which she had set her heart – the care of children. It needed no one to tell us that she was admirably suited for such work. She radiated that charm and confidence, kindliness and mirthfulness of nature that so appealed to the children. She understood the child mind – she was, in fact, just a grown-up child herself! She possessed a wide knowledge of the most interesting things, especially of those things that appeal most to children; she had an inexhaustible fund of capital stories for her small charges, and, most important of all, she could be – and showed herself to be – at one with them. I do not think we had as yet seen anyone so superlatively happy as this gracious soul. In this sphere, our new friend told us, there were to be found children of all ages, from the infant, whose separate existence upon the Earth-plane had amounted to only a few minutes, or who even had had no separate existence at all, but had been born ‘dead’, to the youth of sixteen or seventeen years of Earth time. It frequently happens that as the children grow up they remain in this same sphere, and themselves become teachers for a period, until other work takes them elsewhere. And what of the parents? Were they ever the teachers of their own children? Seldom, or never, our friend informed us. It was a practice that would scarcely ever be feasible, since the parent would be more inclined to be prejudiced in favor of her own child, and there might be other embarrassments. The teachers are always souls of wide experience, and there are not many parents upon the Earth-plane who would be capable of undertaking the care of Spirit children immediately upon the transition of the former. Whether the teachers were themselves parents upon the Earth-plane or not, they all undergo an extensive course of training before they are adjudged fit to fill the post of teacher to the children, and to conform with, and uphold, the rigidly high standards of the work. And, of course, they must all be temperamentally fitted to hold the position of teacher. The work is not arduous, as you would judge it in the Earth world, but it demands a multiplicity of special attributes. The mental and physical growth of the child in the Spirit world is much more rapid than in the Earth world. You will recall what I told you about the absolute retentiveness of the memory here. That retentiveness begins as soon as the mind is capable of grasping anything at all, and that is very early. This seeming precocity is perfectly natural here, because the young mind absorbs knowledge evenly. The temperament is carefully guided along purely Spirit lines, so that the possession of knowledge in one so young never takes upon it the obnoxiousness of Earthly precociousness. The children are trained in strictly Spirit matters first, and then they are usually taught about the Earth world, if they have not already lived in it, or if their Earthly lives were very brief. The Ruler of the Realm acts, in a general sense, in loco parentis, and all the children, indeed, look upon him as a father. The children’s studies have an extremely wide range. They are taught to read, but many other subjects of the Earthly curricula are entirely omitted as being superfluous in the world of Spirit. It would be more exact to say that the children are given knowledge of a particular subject rather than taught it. As they grow they are able to choose for themselves the type of work that appeals to them, and so by specializing in their studies the children can become equipped with the necessary qualifications. Some of them, for instance, elect to return to the Earth-plane temporarily to work with us in the exercise of communication, and they make highly efficient instruments, and thoroughly enjoy their visits. Such visits have the advantage of adding widely to their experience. It increases their depth of understanding of the trials and tribulations – and the pleasures – of being incarnate. There is always one question that arises in the minds of Earth people in connection with children who have passed on: Shall we be able to recognize our children when we ourselves arrive in the Spirit world? The answer is, most emphatically, Yes, beyond all shadow of doubt. But how, if they have grown up in the Spirit world and out of our sight, can that possibly be? To answer that, it is necessary to know a little more about one’s self. You must know that when the physical body sleeps, the Spirit body temporarily withdraws from it, while still remaining connected to it by a magnetic cord. This cord is the veritable life-line between the Spirit body and the Earth body. The Spirit thus situated will either remain in the vicinity of the Earth body, or it will gravitate to that sphere which its Earthly life, so far, has entitled it to enter. The Spirit body will thus spend part of the lifetime of the Earthly body in Spirit lands. And it is upon these visits that one meets relatives and friends who have passed on before, and it is similarly upon these visits that parents can meet their children, and thus watch their growth. In the majority of cases the parents are not allowed within the children’s own sphere, but there are plenty of places where such meetings can take place. Remembering what I have said about the retentiveness of the subconscious mind, you will see that, in such cases, the problem of recognizing a child does not arise, because the parent has seen the child and observed its growth throughout the whole of the intervening years, in just the same way as the parent would have done if the child had remained in the Earth world. There must be, of course, a sufficient bond of attachment between the parent and child, or else this law will not come into operation. Where such does not exist the conclusion is obvious. That link of affection or kindly interest must also exist between all Human relationships in the Spirit world, whether it be with husband and wife, parent and child, or between friends. Without that interest or affection it is problematical whether there would ever be any meeting at all, except fortuitously. The Children’s Realm is a township in itself, containing everything that great minds, inspired by the greatest Mind, could possibly provide for the welfare, comfort, and education, and the pleasure and happiness of its youthful inhabitants. The Halls of Learning are as fully equipped as are those larger establishments in our own sphere. Indeed, in many respects, they are more so, since they have all the equipment for the diffusion of knowledge and learning to those who are possessed of neither in the slightest degree, and who must therefore start at the very beginning, as they would have done had they remained upon the Earth-plane. This concerns those children who have passed into the Spirit world in their extreme infancy. Children who leave the Earth world in their early years will continue their studies from where they left off, eliminating from the latter all that are of no further use, and adding those that are Spiritualistically essential. As soon as they reach a suitable age, the children can choose their future work, and study for it accordingly. What that work can be, I will recount to you later. T he whole question of infant survival had puzzled me considerably when I was incarnate. Ruth said she had no ideas upon the matter whatever, beyond supposing that children must survive, because she felt intuitively that grown people did so. The survival of the one would pre-suppose the survival of the other in a world of anything like law and order – which she presumed the Spirit world to be. Edwin was as perplexed as I was. You can imagine our surprise, then, when we were introduced into the children’s realm, to behold the more than adequate provision made for the young folk who have passed into Spirit lands in their tender years. It is a provision instituted under the greatest and wisest dispensation – that of the Father, Himself – involving no creeds or belief, no doctrines or dogmas, no ritual or formulary. It involves nothing more, in fact, but the plain act of undergoing the ‘death’ of the Physical body, and the operation of the same laws that govern us all, whether infants or aged – just the casting off of the Physical body, and entering, for all time, the World of Spirit. And the children, as might be expected, have the same opportunities, the same rights to their Spiritual heritage as we all have here, young and old. And we all have the same great goal – perfect and perpetual happiness. All told, Monsignor Benson, described the spirit world as one with a constantly shining sun (it never rises and sets). a perpetual summer; there is no dust; all flowers have music in them and of out-of-this-world colors. The waters are buoyant and crystalline and somehow emits energy and doesn’t actually wet you. For those dying suddenly (and cannot accept their passing) and those who die from protracted illness, their traumas they carry with them, hence they are relegated to a rehabilitation hall and healed with blue light.